I put together a short video to give folks an idea of what they will find in the Design-Your-Garden Toolkit book and sticker kit. In the video, I flip through the pages of the design and plant guide, and then I create an example of a plant combo I came up with using the design principles found in the book. It's really more of a book trailer than a "how-to" guide—perhaps I'll take a more in-depth look in a future video. Enjoy! Our local independent bookstore, the Bank Street Book Nook in New Milford, Connecticut, was on the brink of shutting down a few weeks ago when a lovely person from a neighboring town decided to buy it and keep it open! Everyone in our little town is so thankful, especially since the last few months have seen our local coffee shop close its doors, which made everyone sad and scared for the future of our beautiful, historic downtown. We wish the new owner buckets of success, and to help them celebrate their grand reopening, I’ll be joining Amanda Glover of Amanda Bakes for a double book signing at the Book Nook on Saturday, March 31st at 1pm. Amanda will have copies of her recent book, Sweetie Bake Your Day: Sweet and Savory Baked Goods Anyone Can Make, and I'll be bringing along plenty of copies of my new book Design-Your-Garden Toolkit. Michelle Gervais' book Design-Your-Garden Toolkit is featured in Parade Magazine's "Parade Picks" section: "March 12 is National Plant a Flower Day: The Floral Finds You Can't Live Without"
It's NOT just more of the same at Butchart today! After two days of tons of photos you'd think we'd seen it all, but today's photos have a decidedly different point of view. Stunning. Thank again, May, for this wonderful tour! Send photos of YOUR gardens, everyone! Michelle@GardenyGoodness.com. Michelle@GardenyGoodness.com. You know what to do. Yes, I am a woman of few words today... Enjoy! May Kald sent in a whole slew of photos from Butchart Gardens in Victoria, British Columbia, a couple of days ago. She was inspired by Marie and Tony's garden on Monday. I cannot believe we haven't explored Butchart on Gardeny Goodness yet! Thanks, May, for reminding me, and for supplying the means to do so. May says, "I can't seem to get photos of my own gardens organized to send you, but I do have spring photos from Butchart Gardens. These were taken in April 2007 when I went with my mother, who was 93 at the time, so I have included one photo of her. She taught me to love nature and gardening, for which I will be forever grateful." "We married in the 1970s and since then have always shared a passion for gardening. In 1982 we moved to our present family home in Walsall, in the West Midlands, England, where we brought up our four children. Until we retired in October 2009 we had busy jobs: Marie was a transport planner and Tony was a doctor in General Practice. We named the garden we created ‘Four Seasons’. We wanted to create a garden to be used by the family and to be exciting in all four seasons. We totally re-designed, re-landscaped and re-planted our garden without outside help and most of the work has been done since 1992. All but two of all the plants in our garden have been planted by us. We won the battle with weeds, laid a network of York stone paths, built a chalet store, summer house, large wooden oriental pagoda, smaller pagoda, and created four water features, including a cascading 17 metre stream. We have landscaped and created three completely different areas in our main garden. In late autumn 2011 the larger of the three areas which we call the "upper garden" was featured in five national newspapers. The "middle garden" contains the jungle, pagoda and a small stream. Whilst the "lower garden" has woodland like features, an area for perennials, and a much larger stream. In addition to the main garden areas, for the last three years our neighbour has kindly allowed us to use the lower part of his garden as a 'work area' in which, for example, we grow plants from seed and have compost heaps to recycle fallen leaves and other garden waste materials. 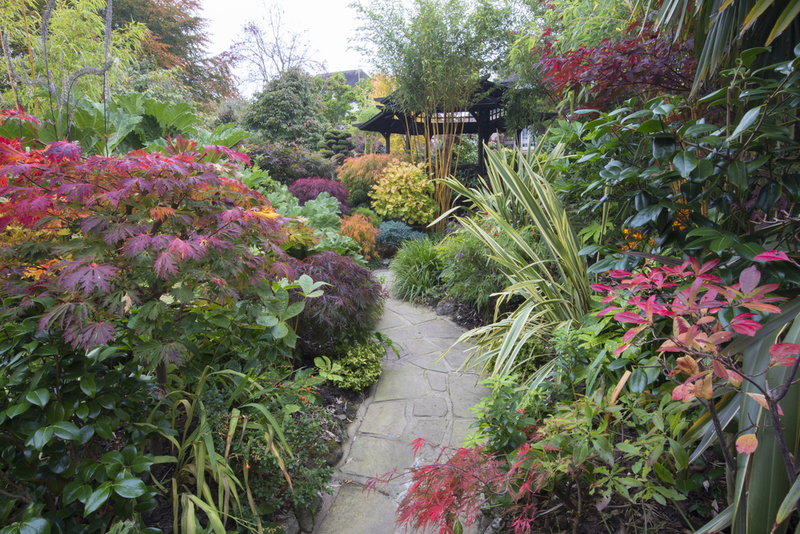 In planting, we especially contrast bold shapes and forms and the colours red, blue, and yellow. In particular we use bright and bold evergreens as a backdrop for flowers. A jungle has been created, including ferns, palms, bamboos and banana plants. We find that timely pruning is the key to maintaining our garden. In early spring, flowers include 'Tete a Tete' daffodils, primulae, and camellias, and this is followed in April by erythroniums, tulips, pansies and scilla. In May there is a stunning array of azaleas together with the new growth of acers and conifers. Other May flowers include Anemone blanda and muscari. Colour continues in June with foxgloves, aliums, poppies and lilies of various sorts. 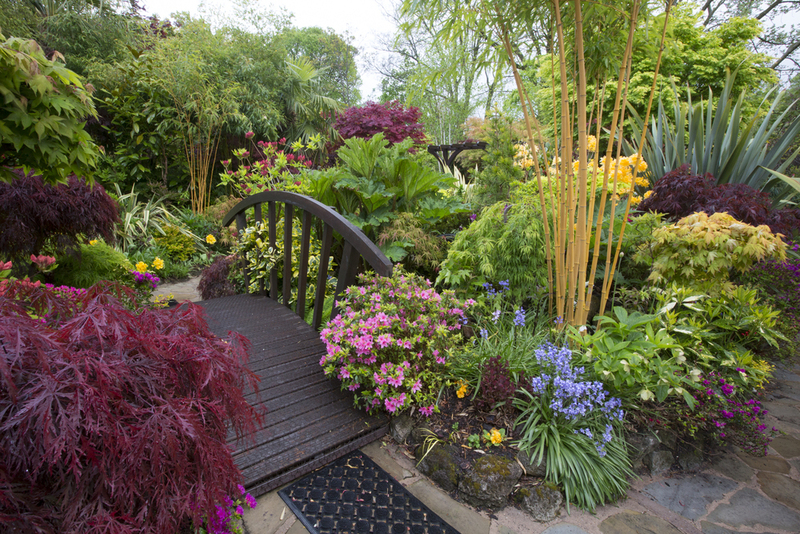 In summer the acers and conifers provide the backdrop to display the riot of colour in the upper garden from flowers including pelargonium, begonias, and bedding plants. The perennials in the lower garden include astors, leucanthemum, agapanthus, crocosmia, thalictrum, helenium and phlox. The jungle becomes more exciting in summer. and children and adults love the mist and tropical bird sounds. Autumn starts with the rich red colour of the Virginia creeper. 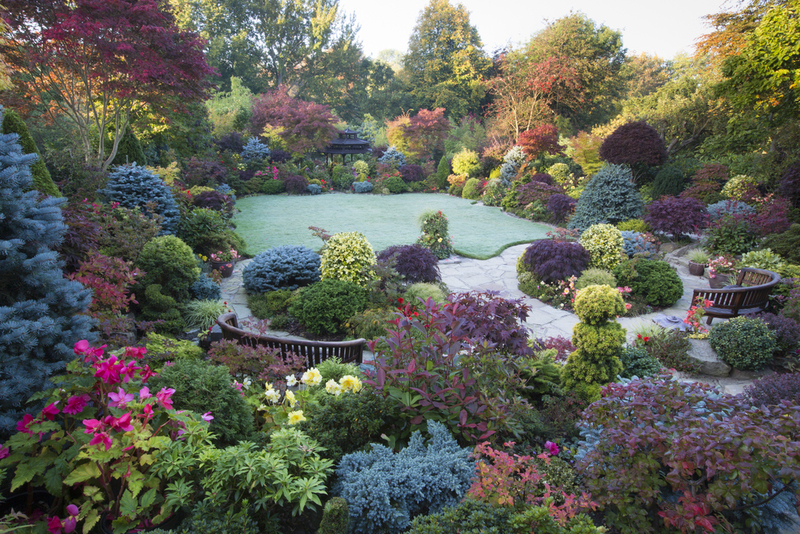 This is quickly followed by the intense colour changes especially in the acers and azaleas. By late autumn the Japanese acer leaves have become become vibrant with scarlet and gold colours and they serve as “autumn flowers”. In winter, we use the colour red in the form of photinia, the red oriental ornaments and the red acer Senkaki stems and contrast these against the blue and yellow conifers and bright yellow hollies. Lighting in the trees creates a magical atmosphere, especially when plants are draped in snow. Winter flowers surge through in February with snow drops, crocus, aconites, cyclamen, hellebores and early camellias. The colour white is accentuated by the multi-stemmed Betula Jaquemontii. Other tree barks, including acer griseum, snake bark maples and serrula, give winter interest. In 2007 we were amazed and delighted that our garden was awarded first place, out of two thousand entrants, in the Daily Mail National Garden Competition. BBC Gardeners' World Television filmed our garden during all four seasons and broadcast a half-hour television feature in February 2010. In 2010 we were honoured and delighted to be awarded another first place, this time in the "Overall Gardener of the Year" category of the UK Garden News Competition. In 2008 we became members of the ngs (National Garden Scheme). Since 2006 we have welcomed more than 12,000 visitors to our garden open days. Most visitors were from the UK however we have also been honoured to receive garden visitors from thirty-two non UK countries. We are sincerely grateful to all our visitors for raising a total of more than £39,000 for our named charities, with by far the largest share going to the ngs." Seriously, guys, this little selection of photos just barely scratches the surface of their garden. It's ridiculously awesome. Go to their Flickr page to see every corner in all four seasons, and also visit their garden web page. Thanks so much for sharing your garden with us, Marie and Tony. What a spectacular achievement. Cherry compiled the most beautiful moments in her garden last year, and they're wonderful. A carpet of green covers large areas of the Pacific Northwest, and it's so pretty! Nancy is taking a look back at some plant combos that made her especially happy this year. Got a gardener on your gift list? Stumped? Let's share our favorite finds, with just barely enough time left before Christmas to get them shipped! Today's post is a celebration of magnificent trees! While the cat's away...have fun with topiaries! 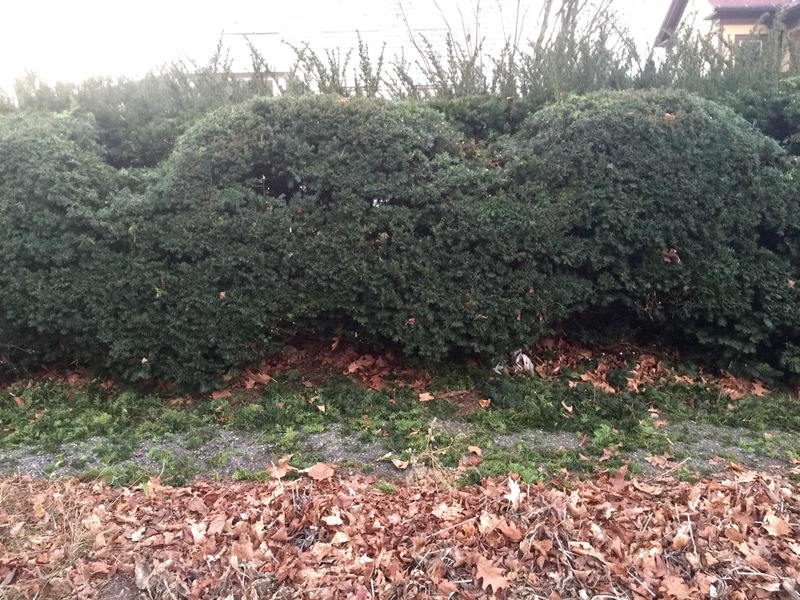 The previous owners planted a massive yew hedge around our front yard many years ago. We don't love it, but we've come to appreciate the privacy it gives to our tiny front garden. it also frames a perfect hollow to hide the garbage cans and compost pile away from the parts of the yard where we hang out. Michelle and I have considered tearing the hedge out a few times, but it would be a big job, and we'd have to fill it with something else, so we keep putting it off. I was home alone one afternoon this weekend, and figured it was as good a time as any to trim the hedge like Michelle had asked me to. I wanted to cut it back quite a bit to make more room for people walking on the sidewalk, but there were't many needles on the inner branches because the outer growth was so dense. From my experience wrangling this hedge over the years, it works well to open up the hedge in small patches here and there so you let light in to encourage new growth on the inner branches. It's a long term process of trimming and waiting, but it looks much better than totally hacking every green needle off the face, leaving a wall of naked branches until the new growth comes in. Let's just say I had an inspiration. I have joked with Michelle over the years about how it was boring to just trim the hedge into a typical tidy shape, and how fun it would be to carve some fun shapes--or even creatures--for the neighbors to enjoy as they walked by. I mean, if you don't like it, it will grow back. So, I present to you, "The Hedgeworm". I'm not sure exactly what it is. An inchworm? A glow worm? The hedge was too small to make a realistic looking snake. Whatever it is, our daughter Kaia loved it. She helped me make a few last adjustments and add the Christmas lights. I'll admit that Hedgeworm needs a little work, but I'll have to wait for some of the new growth to come in before I can do more trimming. When I texted a photo of the final product to Michelle, all I got in response was, "OMG"..."OMG. I'm sure it will grow on her. Sometimes the light of a sunset just draws you out into the garden. You don't have any choice in the matter. Eddi knows, and happily succumbed. Lucky us! Wies' garden puts forth wave after wave of wonderful blooms and foliage, all season long. Field trip, anyone? Wies Voersten's garden will knock your socks off. And to think she started from scratch, and did it all herself!